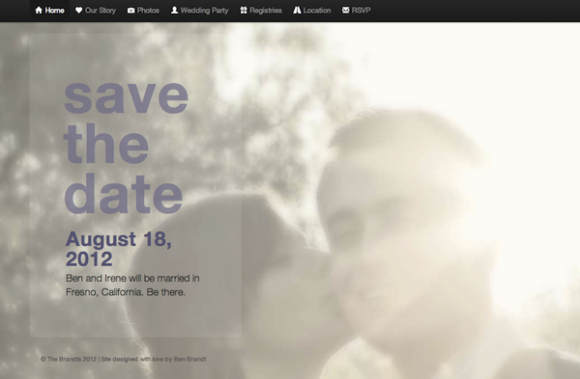 And I just launched the website for our wedding! It was probably the most fun I've had making a website so far, and I'm really happy with how it turned out! It was inspired largely by the lovely Save the Date Irene's Maid of Honor, Sarah Jones, created for us. Definitely hit her up if you have graphic design needs! She's amazing! And if you are as big a fan of the engagement photos as I am, hit up Carsten Tice. These are some of my favorite pictures I've ever taken! It was also a great chance to experiment with Twitter's Bootstrap project. It's a great place to start if you're looking for a good responsive framework, and I was clued into it by the makers of the theme I'm using to run this blog! I've used other "templates" and "frameworks" before, but I must say that this one is my favorite so far! I'd love to hear thoughts and feedback from all of you though! Let me know what you like or don't like about the site, because, while I really love it, there's always more to learn and change. So hit me up in the comments below!